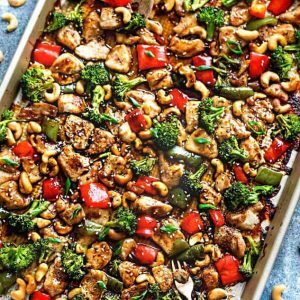 Cashew Chicken Sheet Pan is an easy all in one meal with all the flavors of the popular Chinese restaurant takeout dish. Best of all, it's perfect for busy weeknights and simple to customize with paleo and low carb / keto friendly options. your favorite side: zoodles, cauliflower rice, white or brown rice, quinoa, noodles, potatoes etc. In a medium saucepan over medium heat, whisk together soy sauce, hoisin sauce, vinegar, honey, sesame oil, garlic, ginger, cornstarch, and water until combined. Bring to a simmer, stirring frequently, until sauce thickens and bubbles. Remove from heat and set aside. Divide chicken into lunch containers and add cooked rice, quinoa or potatoes.